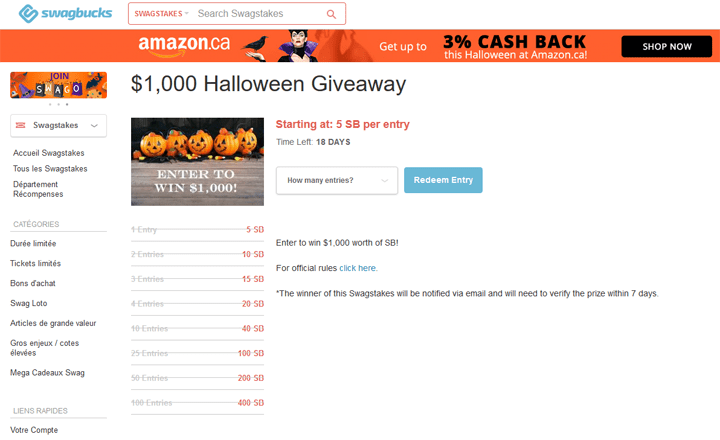 The Swagbucks.com $1,000 Halloween Giveaway is open to residents of the 50 United States and D.C., UK and Canada (Excluding Quebec) 13 years of age and older. The Swagbucks.com $1,000 Halloween Giveaway ends at 11:59 p.m. on October 30. You may redeem 5 SB to receive one entry into the $1,000 Halloween Giveaway. To redeem SB, go to swagbucks.com/s/prize/1629/1-000-Halloween-Giveaway, select an Entry amount and click the “Snag This!” button. Upon redeeming your SB for an entry, the number of SB in your account will be reduced accordingly. On a 3″ x 5″ piece of paper, hand-print your name, complete address, and daytime and evening telephone numbers, and mail to: $1,000 Halloween Giveaway, P.O. Box 70 Manhattan Beach, CA 90267. Limit one entry per envelope. One (1) Grand Prize. $1,000.